The present study aimed to determine the frequency of subtypes of Blastocystis sp. in the immunosuppressed individuals, in patients with chronic urticaria, and in patients with GIS complaints to investigate the difference of Blastocystis sp. subtype distribution between patient and control groups. A total of 345 stool samples were collected from the patients and samples were studied by native-Lugol, trichrome staining, and Jones medium culture method. Positively detected samples were subjected to PCR to determine the subtypes. This is the first study of nine subtypes of Blastocystis sp. investigated in our country and the most frequently found subtype was ST3, and then, the other subtypes were ST1, ST2, ST5, and ST6, respectively. Mix subtype was detected in the 11.6% and no subtype was detected in the 17.4% of the samples. The ST5 was detected first time in the control group and ST6, which is reported limitedly in our country, was found in patients with GIS complaints. ST1 and ST2 were found higher in the patient group. This study confirmed that the subtype (ST) differences are an important factor affecting the pathogenesis of Blastocystis sp. This Project was supported by DUBAP (Dicle University Scientific Research Projects) with the number of TIP 15-035. Ajjampur S.S., Tan K.S. 2016. Pathogenic mechanisms in Blastocystis spp.—Interpreting results from in vitro and in vivo studies. Parasitology International, 65, 772–779. https://doi.org/10.1016/j.parint.2016.05.007. Alfellani M.A., Taner-Mulla D., Jacob A.S., Imeede C.A., Yoshikawa H., Stensvold C.R., et al. 2013. Genetic Diversity of Blastocystis in Livestock and Zoo Animals. Protist, 164, 497–509. https://doi.org/10.1016/j.protis.2013.05.003. Arisue N., Hashimoto T., Yoshikawa H., Nakamura Y., Nakamura G., Nakamura F., et al. 2002. Phylogenetic position of Blastocystis hominis and of Stramenopiles inferred from multiple molecular sequence data. Journal of Eukaryotic Microbiology, 49, 42–53. https://doi.org/10.1111/j.1550-7408.2002.tb00339.x. Balint A., Doczi I., Bereczki L., Gyulai R., Szucs M., Farkas K., et al. 2014. Do not forget the stool examination!-cutaneous and gastrointestinal manifestations of Blastocystis sp. infection. Parasitology Research, 113, 1585–1590. https://doi.org/10.1007/s00436-014-3805-0. Clark C.G., van der Giezen M., Alfellani M.A., Stensvold C.R., 2013. Recent Developments in Blastocystis Research. 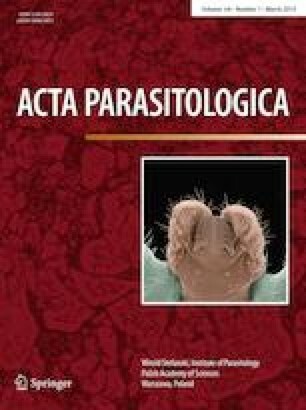 Advances in Parasitology, 82, 82, 1–32. https://doi.org/10.1016/b978-0-12-407706-5.00001-0. Dogruman-Al F., Dagci H., Yoshikawa H., Kurt O., Demirel M., 2008. A possible link between subtype 2 and asymptomatic infections of Blastocystis hominis. Parasitology Research, 103, 685–689. https://doi.org/10.1007/s00436-008-1031-3. Dogruman-Al F., Yoshikawa H., Kustimur S., Balaban N. 2009b. PCR-based subtyping of Blastocystis isolates from symptomatic and asymptomatic individuals in a major hospital in Ankara, Turkey. Parasitology Research, 106, 263–268. https://doi.org/10.1007/s00436-009-1658-8. Eroglu F., Genc A., Elgun G., Koltas I.S. 2009. Identification of Blastocystis hominis isolates from asymptomatic and symptomatic patients by PCR. Parasitology Research, 105, 1589–1592. https://doi.org/10.1007/s00436-009-1595-6. Hussein E.M., Hussein A.M., Eida M.M., Atwa M.M. 2008. Pathophysiological variability of different genotypes of human Blastocystis hominis Egyptian isolates in experimentally infected rats. Parasitology Research, 102, 853–860. https://doi.org/10.1007/s00436-007-0833-z. Lee I.L., Tan T.C., Tan P.C., Nanthine, D.R., Biraj M.K., Surendra K.M., Suresh K.G. 2012. Predominance of Blastocystis sp. subtype 4 in rural communities, Nepal. Parasitology Research, 110, 1553–1562. https://doi.org/10.1007/s00436-011-2665-0. Ozyurt M., Kurt O., Molbak K., Nielsen H.V., Haznedaroglu T., Stensvold C.R. 2008. Molecular epidemiology of Blastocystis infections in Turkey. Parasitology International, 57, 300–306. https://doi.org/10.1016/j.parint.2008.01.004. Ragavan N.D., Govind S.K., Chye T.T., Mahadeva S. 2014. Phenotypic variation in Blastocystis sp. ST3. Parasites & Vectors, 29, 397:404. https://doi.org/10.1186/1756-3305-7-404. Tan K.S., Mirza H., Teo J.D., Wu B., MacAry P.A. 2010. Current views on the clinical relevance of Blastocystis spp. Current Infectious Disease Reports, 12, 28–35International Journal of Dermatology, 55, 259–266. https://doi.org/10.1111/ijd.13064.